The University of Derby is a multi-site University with campuses in Derby and Buxton. Emma Butler is a Subject Librarian for the Buxton Campus, and has been running learning sessions with her students using MindGenius and mind mapping. She captured a recent session she ran for her students for YouTube, so that students doing the module via distance or e-learning could also experience the session. Here she tells us the purpose of the session and how it helped her students. “I was introduced to mind mapping by some of my colleagues who teach on the Further Education courses run by the University and I do use MindGenius myself for my own work purposes. It's really useful for brainstorming ideas at the start of a project or piece of work. I use it with students to help them to make their planning as effective as possible. “The particular session we filmed for YouTube was a repeat of one that we did last year for students on the same module and the impetus for it came from the module leader for Marketing and Promotion, Sheila Mclaughlin, who believes that working with mind mapping and MindGenius helps recognize different people’s learning styles and encourages students to work with skeletal frameworks. Working with skeletal frameworks helps the students to think through their work more logically, coherently and creatively compared to just start writing a document. “The purpose of the session was primarily to give the students an opportunity to start planning their module assignment, but also to use the tools and resources available via MindGenius to make this planning as effective as possible. “We do want the students to develop creative thinking skills and MindGenius can certainly help with this but I think, more than that, the software actually enables the students to almost visualize their essay. They can see where the longer paragraphs are going to be, perhaps where they need more information, and which sections they have quotations, evidence and articles for etc. One of the key benefits of using MindGenius is that it allows the students to get all their ideas written down quickly and easily, and they can then rearrange and move sections as necessary. “In this particular session, we demonstrated MindGenius while class members sat at a computer and worked along with us to build their own map. We talked through their assignment on the “Analysis and Evaluation of Communication and the Promotional Mix at the University of Derby”, the requirements of their essay, and the elements they needed to include: for example Services Communication, to cover the characteristics of a service, a focus on marketing to students, an analysis section using the Pieters model, and their recommendations. Building a map in this way, allowed students to get to grips with using MindGenius too, including some of the functionality they might find particularly useful such as adding attachments to work out their search strategy and exports to MS Word, to be used when they were happy they had produced their essay framework. We also covered the Gantt view. In this instance, I suggested they create a separate map for their recommendations and then turn this into a Gantt chart. This allowed them to visualize the amount of time required to implement their recommendations. The video is around 40 minutes long as it covers a teaching session. Why does everything need to be completed by the year-end? The end of the year is often used as an immoveable milestone – often self-imposed and it’s not just at this time of year that you can find yourself feeling overloaded with too much to do and needing to bring a bit of clarity to proceedings. Try this process to get clarity on what needs to be done to achieve your year-end milestone and improve your general productivity. Start by bringing together everything that’s on your mind. Brain dump and capture in a map; the tasks you need to close out, people you need to connect with, loose ends to tie up and the Xmas shopping to do! Add structure to your map by grouping the ideas to get more clarity; Projects, Phone calls, emails, Shopping etc. Brain dumping and visualizing your ideas and information in this way is the fundamental reason you are able to quickly achieve clarity on any situation. Your tasks are concisely captured, connections & relationships are easier to see and the graphical view on you tasks encourages and helps you identify and remember other associated tasks. Feedback tells us that this is one of the most effective uses of the application and the starting point for many projects. Now identify what you want to achieve, it can't be everything but at least identify the most important ones and what you'd be happy with. It now depends on what task management methodology you would normally adopt. Try prioritizing everything and start working on the high priorities, moving onto the lower priorities only when the high ones are completed or simply remove the lower priority tasks to another map (or section of current map) to deal with later. Either way you should be left with a clear view of what you are trying to achieve. All you have to do now is complete those tasks! Task Management and Time Management are huge topics in their own right to be covered in the coming months. At this time of year everyone has too many things to do, and Christmas shopping can be another time consuming activity. Maybe you are organized and have everything done by now, but if you’re getting stressed about how you will fit everything in, using MindGenius can speed up and simplify the process for your holiday shopping. Brainstorm your ideas for presents; who do you need to buy for, is there anything you know you need to get such as sweets or drinks. You can now quickly re-order your map, you can add structure by breaking your map down by person to buy for or stores you need to go to. The way I’ve done this is to drag and drop present ideas underneath the people I am buying for. This way I can then focus in on each individual using Map Explorer and brainstorm specific present ideas. Next, consider your budget and whittle down your initial ideas into those you want to go ahead and purchase. Apply the categories to your presents, presents can also have multiple categories if you're not sure which stores you will get the gift in. 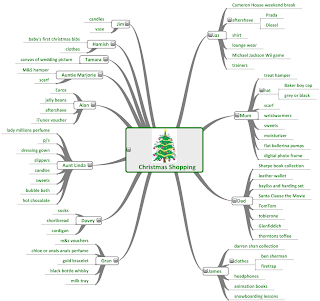 Create a category map of your gifts - this will show which gifts you need to get in each store and speed up your Christmas shopping, make the process easier and help you not to forget anything vital. Additional tip - I know from personal experience when you order multiple items online, it can be difficult to remember what you've ordered and whether or not you've received it. You could create and add separate categories for "ordered" and "received" to keep track of your items. Your map could be expanded out to cover your holiday food and drink shopping, or when you have guests visiting and the tasks you need to complete before they arrive so you end up a map with an entire holiday plan. That's it - holiday shopping completed. If you would like some inspiration on what to buy people, download my Christmas shopping map. Daniel Rae has been Web Community Champion for Gael Ltd 3 years and is responsible for Gael’s online community, supporting Gael’s online strategy, and is involved in IT web projects to improve online presence. This has included the creation of new websites in addition to a complete restructure of the current website. This involved splitting the Gael corporate site from the current product specific Q-Pulse site, as well as migrating sites that use different content management systems (CMS) to a single CMS. In his time at Gael, Daniel has developed the Gael community from scratch. The community is an interactive online community for users of Gael's software and services and currently has over 3000 users. It encompasses multiple active discussion forums, a variety of blogs, and is the first stop for Gael's customers' support needs with its in-depth product knowledgebase and support case management. He also has responsibility for prioritising and actioning changes and improvements to the main company website. Daniel’s job title is not project manager but he recognizes that that's exactly what he has had to do to ensure delivery of his projects to management both on time and to budget. Firstly, I will get the team together to brainstorm requirements and identify everything that needs to be done. This allows us to benefit from team experience and knowledge, and ensure there are no surprises later. If the group stalls or hit a wall, we can apply different methodologies and questioning techniques to ensure we elaborate on key points to achieve a rounded view which helps us to minimize risk. Here is an example of tasks identified as we discussed finding and implementing a new content management system (CMS). The next step is understanding how the project will come together and after the brainstorming stage is finished, I can develop understanding on the key points by adding structure to the ideas. This allows me to visualize the phases of the project and the tasks associated with each stage. We continue to use team experience for working out who's best to do what, and an estimation of timings. We used the Gantt view during this process to get a visual representation of phases and tasks which gave us a clear picture of the tasks involved and how they impacted on others. I then presented the overall plan back to the team so that everyone is clear on what is required. I also produced specific resource centric views of each person’s tasks. We’ve taken the project to the stage where we are ready to deliver it but we’ve minimized risk via following this process and concentrating on our planning. This leaves us confident we can deliver on time and to budget. Before being introduced to MindGenius, I used MS Excel for project management but I think that using a tool like MindGenius allows us to spend more time planning and be more agile in delivery. MindGenius has played a pivotal role throughout the brainstorming of ideas for the projects and the Gantt view gave a clearer view of all tasks involved in the project, and how these impacted on each other, along with how the project team needed to work together on the assignment." The contents of the maps are now indexed by windows, allowing users to search for branch titles, attachment names, resources and notes within map files. Users are able to preview a map without the need to open the file in Explorer. Note, the preview pane must be turned on. Users now have the ability to save, as well as open, the OPML format. Users can now control page setup and print options. Export MindGenius calendar (and working exceptions) to Microsoft Project. Allow users to alter the Gantt view timeline. Import OPML files (e.g. iThoughts). MindGenius 3.5 allows you to view your map and its associated task information in a Gantt chart. The Gantt chart is generated based on the branches, their task information and their relationship in your map. The Gantt view is seamlessly integrated within MindGenius, allowing you to switch between map view and Gantt view with the click of a button. MS Excel export for use with pivot table analysis, parts lists, costs, task management and FMEA Analysis, allowing you to work with numerical values as well as words. Numerical fields added that allow you to record actual work hours, costs and quantities and undertake cost and quantity calculations. Updated image library with a suite of pictures that can be used royalty free by all MindGenius users. Ability to add and edit your own question sets in the Question Tool allowing you to undertake improved planning and brainstorming sessions and create frameworks for meetings and customer facing sessions. Timer to allow you to keep on schedule in brainstorming, meetings and presentations. Ability to import Mind Manager files. If you are a MindGenius Business V2 customer, you can still upgrade to MindGenius 3 (latest release version 3.7) for just £117 / €135 / $188 (+ VAT where applicable). If you are a MindGenius Education V2 customer, you can still upgrade to MindGenius 3 (latest release version 3.7) for just £45 / €52 / $72 (+ VAT where applicable). Purchase a Version 3 Upgrade license from our Online Store. MindGenius Version 3.7 is now available to download. This maintenance release is free to all Version 3 customers. ***Important note***If you are an Enterprise customer, please contact your IT Administrator for details on how to update your version. Do not download from the link above. For details on new functionality in this release, click here. If you have any questions on this, please contact us at info@mindgenius.com.